This ancient fly, dubbed Trichomyia lengleti, is one of a handful of bugs added to a new online database of "digital fossils." Paleontologists from the European Synchrotron Research Facility in France used high-energy x-rays to peer inside 640 pieces of opaque, fossilized amber that date to the Cretaceous period, 145 to 65 million years ago. The fossils were found in 2008 in from the Charentes region of southwestern France. Until recently, fossils inside opaque amber were invisible to paleontologists. But the new accelerator technology revealed unprecedented views of 350 previously invisible insects, animals, and plantswhich could previously only be studied from fossilized mud imprints. Using x-rays for paleontology is a new and important technique for seeing inside fossils that you can't cut or break open, said researcher Paul Tafforeau. "When we are dealing with fossils we have to study them, but we also have to preserve them." You won't find this cockroach crawling around city apartments--It scurried across the earth around 60 million years ago. 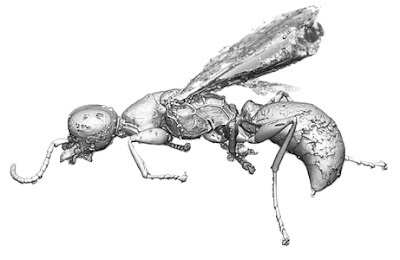 But now x-ray radiation has revealed the prehistoric critter frozen inside a piece of opaque amber. 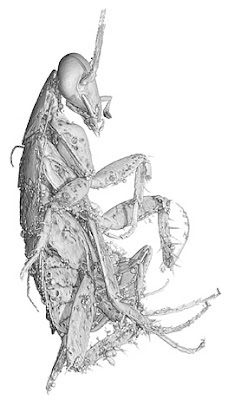 The cockroach was added to a new online database of digital fossils, which have become a new area of study in archaeology and taxonomy. 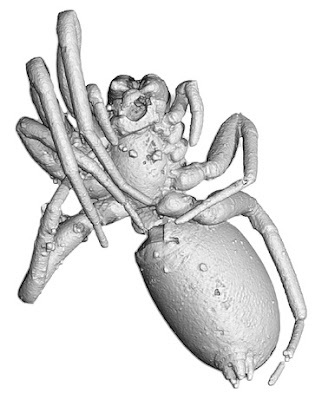 A hundred-million-year-old spider (above) is seen buried inside a tomb of opaque amber. The digital fossil--a combination of multiple x-rays--was recently added to a new online database compiled by French researchers. A hundred-million-year-old millipede ancestor encased in amber (pictured) was recently imaged by researchers from the European Synchrotron Research Facility. Using a high-resolution scan called microtomography, researchers pinpointed finely detailed body parts, such as bristles, tiny legs, and insect wings--and even the hairs on the one-millimeter-long millipede. In just 48 hours of imaging with a particle accelerator, researchers found more than 350 previously invisible creepy crawlies from Cretaceous-period amber (above right). 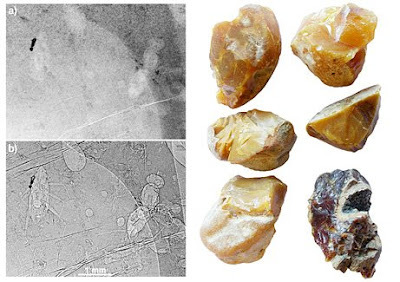 Cracks and imperfections often show up in x-rays of amber (above, top left), posing a challenge to paleontologists who want to see the amber's contents. But a research team at the European Synchrotron Research Facility found that soaking amber in water fills in cracks, allowing for much clearer views of the insects (top, bottom left). 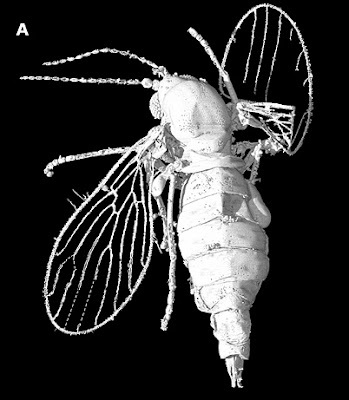 This prehistoric wasp-like insect, called Hymenopteran falciformicidae, was recently revealed by new x-ray technology. 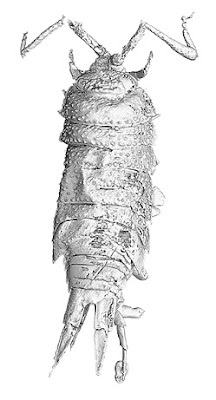 European researchers are investigating innovative ways to visualize these digital fossils, such as 3D physical models and glass blocks with the a print of the specimen inside. This hundred-million year old isopod crustacean--an aquatic relative of woodlice--was one of more than 350 insect fossils found hiding in chunks of amber. 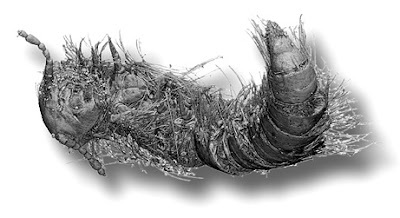 The critter was added to the European Synchrotron Research Facility's new online database of "digital fossils," which is accessible to the public.